Foodies who spend any time in Kyoto will want to dedicate at least one evening to Pontocho, an incredibly atmospheric dining area packed with restaurants and exclusive tea houses lining a narrow, cobbled alley just west of the Kamo River. Visitors from around Japan and the world come here for the open-air dining along the river and the opportunity to spot apprentice and master geishas scurrying to their appointments. While most of the tea houses are difficult to visit without a connection, visitors will find a range of restaurants — everything from inexpensive yakitori to modern Kyoto cuisine – to choose from in the evenings. Pontocho is rather quiet by day, so plan your visit for the evening hours to experience the alley at its best. Get an insiders' eye perspective on Kyoto on this walking tour that combines a food tour with anthropological insight. Wander through the city's streets and understand the nighttime entertainment scene, from geiko (geisha) to hostesses. Afterward sample regional specialties accompanied by included drinks at two standing bars/restaurants. Experience the glowing lanterns and lively atmosphere of Kyoto after dark on this 3.5-hour evening walking tour with a small group. Experience the ancient Japanese capital after dark as you stroll the city’s serene back streets and visit city landmarks like Yasaka Shrine, the Pontocho restaurant district, and a ‘tachinomiya’ stand and drink shop for included food and drink samples. Get an excellent introduction to the cuisine of Kyoto with this small-group guided tour of the city's best food spots. Start at the deliciously vast 400-year-old Nishiki Market, nicknamed 'Kyoto's Kitchen,' where over 130 food shops and stalls beckon your taste buds. Stroll through the market with the guide, learning about the history of food in the city and taste many dishes unique to Kyoto, including pickled vegetables, fried fish cakes, Japanese pike conger eel, mochi and Japanese omelet. After the market, visit a shrine dedicated to the god of education. Take control of your Kyoto sightseeing and visit only the sights you wish to see on this private walking tour. Ideal for first-time visitors, this tour lets you customize the 2-, 4-, or 7-hour itinerary. Opt to visit the Golden Pavilion (Kinkaku-ji), Fushimi Inari Shrine, and Nijo Castle, or to stray from the beaten path to see an alternative side of Kyoto. Hotel pickup and drop-off are included. For outsiders, Japanese culture can be difficult to grasp but this guided tour offers the chance to get a locals' eye view of one of the most traditional of Japanese settings. Accompanied by a guide, stroll through the historic streets of Kyoto's Gion district, famed for its scenic cobbled streets lit by paper lanterns, traditional architecture, and association with geiko and maiko culture. Visit Pontocho alley, one of Japan's oldest nightlife areas, and stroll by geisha teahouses as your guide offers insights into local culture. Stroll the back alleys of Kyoto, missed by many visitors, as dusk falls and they are at their most atmospheric on this private guided tour. In the company of just a guide and your party, see how ancient tradition blends with contemporary culture as you explore the enchanting wooden alleyways lit with traditional paper lanterns in the historic Gion district and the picturesque streets of old Pontocho, where, with luck, you might spot a geisha or two. Get a deeper experience of Kyoto food culture than would be possible on your own by joining this guided tour. 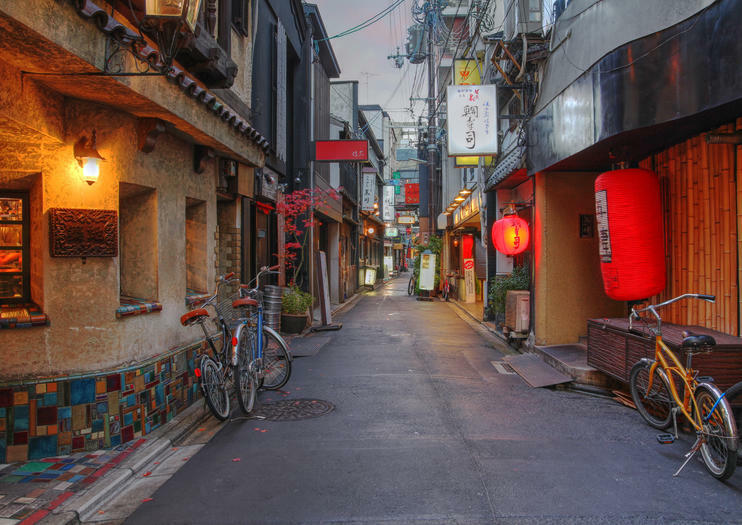 Stroll through the districts of Gion and Pontocho, stopping in to small bars and restaurants to sample traditional drinks and food, as you explore. You can try some different types of Japanese drinks and dishes recommended by the locals, all in three hours! It can be hard to know where to go to get the best local food in a city as full of delicacies as Kyoto. Join a professional guide for a 3-hour tour of the Nishiki Market, Gion district and beautiful Fushimi Inari-taisha shrine. Visit "Kyoto’s kitchen," learning about the history of food and tasting unique dishes such as tofu skin, pickled vegetables, and sake. Your guide takes you through Gion to see historic landmarks, spot Geisha, and give you a glimpse of Japanese spirituality. Enjoy an action-packed evening in Kyoto learning about Japanese food and drink. You won’t have to worry about navigating or getting lost as a guide will lead the way. By traveling in a small group, you’ll have better access to your guide for questions. Explore Nishiki Market together, visit a secret bar, restaurants, and learn about Kyoto’s Geisha culture in Pontocho. You’ll enjoy food and drink tastings along the way, making it a fun and interactive experience.